For me, my first cellular phone ever, was in fact a Nokia. If the same happened to you at some point, you defintiely remember playing the famous snake game on your phone. It was simple, you used your directional pad, or number keys, to move the snake around on the screen where it was contained by death walls along the edge of the screen. The goal was to get a high score, eat as many black dots (isolated pixels) as you could without running into yourself, or a wall. Nokia kickstarted the whole mobile-gaming scene back in 1997 with this simple, yet addicting game. Now you too can have it on your Windows Phone! Available on the marketplace for $0.99 (free trial available), grab this great game to relive Nokia gaming history. There are many other similar ‘snake’ games available on the marketplace, but none are better than this Nokia approved one. Developed by dsd 164 B.V. this is the closest you will get to the original Nokia phone experience, as stated by Nokia. Nokia even mentions the interface, sounds and even feel are dead on to the old days. GLOBAL – The Nokia Snake game is a classic that kickstarted the whole mobile-gaming scene back in 1997. If you had a phone in the late 90s, the chances are you had this game – or several of your friends did. 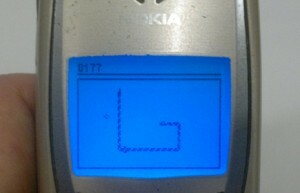 You can still play our online Nokia Snake game, but what if you’re offline? Snake ’97 is available for your Nokia Lumia and recreates the old favourite, right on your phone. There are lots of snake games on the market, but none of them capture the feel that you had with the classic game on the old Nokia phones. Besides, Snake ’97, that is. As far as interfaces are concerned, this one is just perfect. Your touchscreen is transformed into a replica of a Nokia 5110, with the keys positioned at the lower part of the screen. It turns retro gaming into an art form. The black snake appears above the keys on the bright green screen, as it did back in the 90s. To control the snake, use the buttons below to navigate the snake in the direction of the black dots, which it will eat. Careful, though, crash into the walls and your game is over. You can control the difficulty level by hitting the settings key on the virtual keypad. By increasing the level, your snake will travel faster. This is the most realistic Nokia Snake game we’ve ever come across. The sound effects are identical, the gameplay is exactly as it was back in the day and the replica Nokia phone interface makes you feel nostalgic.